Exquisite Waterfront Estate. Breath taking views of the Vernon River & Marshes just min. from downtown. This secluded 5700 sqft 4bed 3 full/3half ba Contemporary Home awaits new owners to appreciate expansive Sunset & Vista views. A long, winding driveway leads to this private haven. 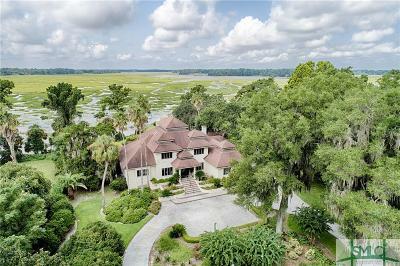 Majestically set on 5.14 acres w/water frontage. Dramatic 2 story windows frame the captivating scenery as one enters. Impressive! An open floorplan provides great flow between main rooms & exterior. A luxurious master suite w/a wall of waterviews, is on the main level. The home includes: Library, Bonus Room w/half ba., Great Room. A beautifully designed pool area starts from the upper patio & steps down to the pool area-complete with kitchen & cabana. Entertain w/ease. There is no shortage of views from the home, pool & observation deck. Kayak from your private dock. A perfect refuge. Features: 3 car gar., 36 KW Generac Gas Generator. No flood zone. Click Reel above for Video.